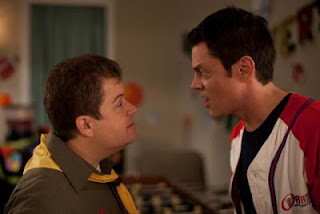 Fourth Row Center: Film Writings by Jason Bailey: #SXSW Review: "Nature Calls"
Patton Oswalt stars as Randy Stevens, a Boy Scoutmaster trying desperately to follow in the footsteps of his father, who gave him his love for scouting. “When he’s gone,” Randy says, “it’ll be up to me.” Trouble is, scouting’s not so cool these days; Randy’s troop has dwindled to three or so highly unenthusiastic boys, all of whom cancel out on Randy’s big weekend camping trip so that they can go to a sleepover for Dwande (Thiecoura Cissoko). And Dwande is the newly adopted son of Randy’s brother Kirk (Johnny Knoxville), a Scout-hating vulgarian who’s made a fortune selling ATMs. The idea of his precious few scouts spending the weekend watching Kirk’s half-dozen TVs (all in the same room, all blaring garbage) instead of discovering nature is more than Randy can bear, so he sneaks in to the house, talks the boys into the camping trip, and sneaks them out. Oswalt, one of the most gifted stand-up comedians in the game, doesn’t get as many laugh lines as he deserves (though there’s something wonderfully innocent about the way he proclaims, “Hey America! Tropue 1156 is here and we’re about to go camping in you!”). But it’s a good piece of acting—he brings a real presence to what could have been a one-not role (it’s certainly written as one), projecting a sense of a life lived, and presumably filled with disappointments. Knoxville, on the other hand, is mostly phoning it in here, though both actors pivot into the darker territory later in the film with ease. Rohan’s filmmaking is oddly choppy; he shoots everything just a bit too close-up and broken-up. We often seem to be joining scenes in progress (and not in a good way), and his sequences slam into each other uneasily. He can’t seem to get a handle on his tonal shifts either; Knoxville is put through a physical ordeal (no surprise) that is, initially at least, not played for humor—and the audience I saw it with didn’t really seem to know how the hell to react to it. Finally, thankfully, he goes for the big, broad laugh that we’re comfortable with. It’s not that there isn’t something commendable about taking what could be an obvious, doltish farce and injecting it with a bit of darkness and humanity. But Rohan’s script isn’t sophisticated enough to juggle the shifting accents, and his direction isn’t fluid enough to smooth over those shifts. Try at it might, Nature Calls doesn’t really work. "Nature Calls" is screening this week at the South by Southwest Film Festival.